I live out in The Southern California High Desert, Joshua Tree to be exact. 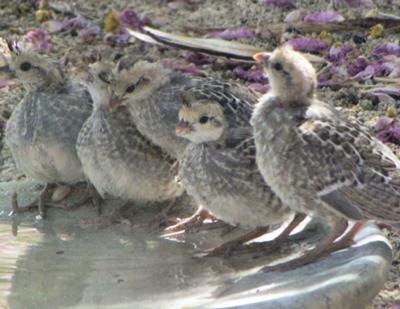 I have added many photos of my nesting Mourning Doves, but now I want to show some of the beautiful little quail babies. 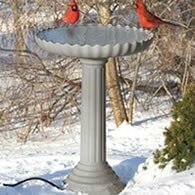 I have a top of a very shallow bird bath sitting under some Desert Willow trees providing water for all the critters, and yes even pesky squirrels. 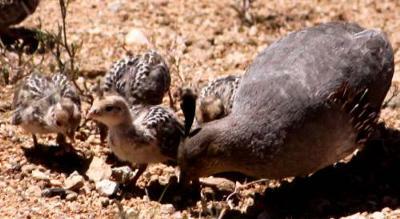 The other day I was able to photograph a small flock of baby Gamble's Quail getting a drink. I have hundreds of quail and their babies. 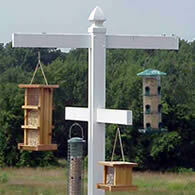 I feed the Doves, Quail, and bunny's chicken scratch, so they all know where to go to get food and water. I have several large windows looking out into the yard to watch the fun. This is a close up of the babies taken from my window. Cute aren't they? 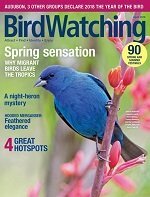 Comments for Baby Gambel's Quail, Everywhere! So adorable!! Like little chickies. I pray they all made it. So much fun to watch the families. Great picture! Join in and write your own page! It's easy to do. How? 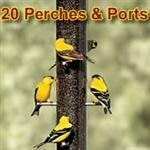 Simply click here to return to Backyard Birds. 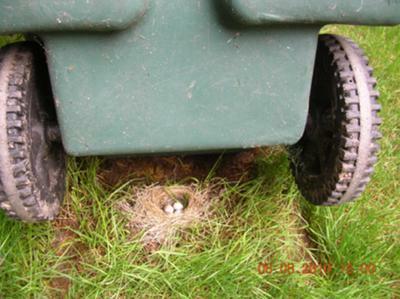 Grandson and I discovered the nest only after the daddy bird scurried out from under the can. Hi all you out there that love watching the Quail! A few years ago I posted "Woohooo a Gambels Quails nest" now I will finally put in some pictures! Anyone who wants more can leave me their email, under Gene's suggested way to do it without anyone being able to get it through hacking. Example, MarykayATyahooDOTcom All written out like that. If the picture could be bigger, you'd see a whole bunch of babies and Dad too! I love seeing the babies they are the cutest things. 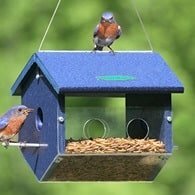 We have had the unique experience of having them nest nearby, and watching as they go from eggs to newborns to little babies ready to run with mom and dad! Its such a beautiful thing to witness! Cindy Calif. High Desert Mtns. I have discovered a quail nest in a pile of trimmings from trees. I am not sure of its exact position but luckily cracked only one of a dozen or so eggs while moving the pile with a tractor. I carefully pushed it back to where I believe is the original position then constructed a stick shelter with access, bird size, over and around it. Please advise if you have any suggestions. We have a new dozen babies that have already shown themselves and there are many "parents" usually around the house that seem to avoid this area, I am supposing this is during gestation. How covered does the nest need to be? I did not touch the eggs but rolled them back to an un scattered central "nest". I have not built a nest before so I am hoping they will be ok, adults are used to us and so our scent is all around anyway. 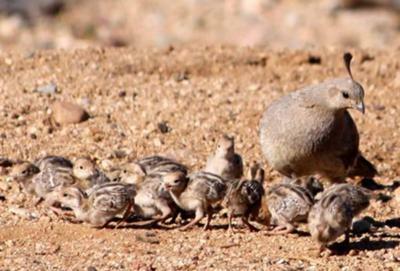 This year we have seen more Quail babies than ever before! And Quail pairs having larger numbers in their clutches than I've ever seen before! They have so many noises! Here is just one of the many pictures I have captured with my camera. There were several more babies I couldn't fit in the picture here, Momma was looking at them. I always say, have camera, will travel!! Hope you enjoy the pictures! 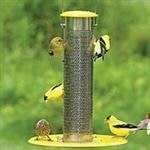 I have been wanting to buy this certain window hummingbird feeder that has this little moat around the edges as an ant guard. 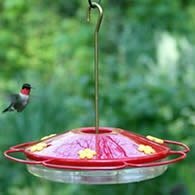 I am enjoying these little Hummers so much. I thought it'd be neat to see them at my window. My sister has one and she is so excited to have it. But she lives in the City far away and not in the deserts or mtns. as I do. 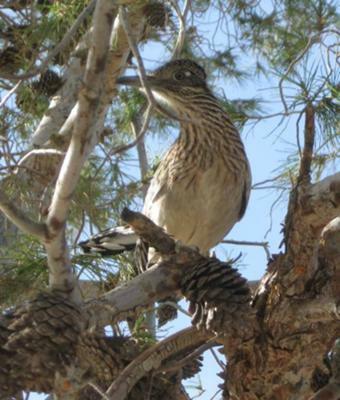 I have MANY Roadrunners here. They frequent my porch, looking for lizards, and such. I have seen them grab a Wren and eat it, also snakes, etc. 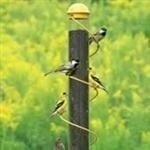 They also are a predator to the little Hummingbirds. Deciding whether to place the feeders in safe place, where the lil' ones can come and go, and see everything around them, or hide in the tree for a quick perch and grooming session they can still be on the lookout. I just realized that it would not be fair to them to sit and face my window with their back turned to their surroundings. Being not too far from the ground they could fall victim to their predators. They need to be able to see all around themselves at all times, so they can dart away from danger. It would bother me terribly, to think that they could be hurt or worse, lose their lives because I didn't weigh the pros and cons of such a feeder. I don't need to be that selfish in putting their little lives in danger. 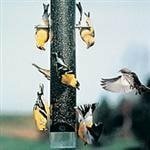 Maybe for some with higher windows and not in the desert this wonderful, antless window feeder would work.